As Carol Bond indicated in the comments to the recent blog post about the successful HSC Health and Wellbeing Community Conference the community agreed to select a twitter hashtag in order to collect information from any tweets relevant to the activities of the community. I was tasked with organising this, being familiar with the concept, and after a wait for the registration to come through I can confirm that the hashtag is #hwbbu (Health and Wellbeing at Bournemouth University). The hashtag is registered with the Healthcare Hashtags Project here. This project maintains a date-searchable archive of the tweets of healthcare relevant hashtags as well as allowing analysis of activity and reach. We went for a short hashtag because this is good practice with Twitter being limited to only 140 characters for each tweet. As you’ll see from the rather fetching picture from the conference post, I took part in the biscuit taste test organised by Dr Heather Hartwell who was talking to us about the concept of ‘Health by Stealth’. 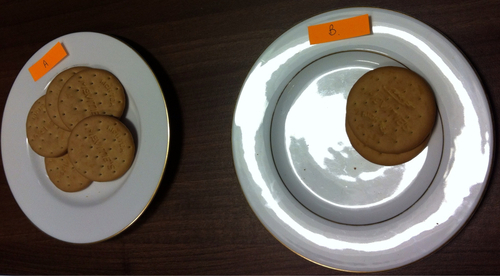 We tried two Rich Tea biscuits from the same company and, despite what the picture shows, most people preferred biscuit A. This was actually the ‘Light’ version! Less fat, less calories, slightly more sugar needed to bond it but crunchier (less claggy) and the same price. The problem is we tend to think of ‘healthy’ versions as not being as tasty. I did manage to guess by sight which was the healthiest so was therefore surprised to prefer its taste. As someone who likes a sweet snack I think it’s definitely worth trying out lighter versions in future. I am a Lecturer in Occupational Therapy in HSC and newly registered MPhil/PhD Student. I am planning to use online focus groups that run over a period of time to collect my qualitative narratives and I am hoping to speak to anybody that has experience in carrying out online research. So, if you are happy to meet up over a coffee to discuss the benefits and challenges you have faced, as well as potential technological issues then please do contact me.